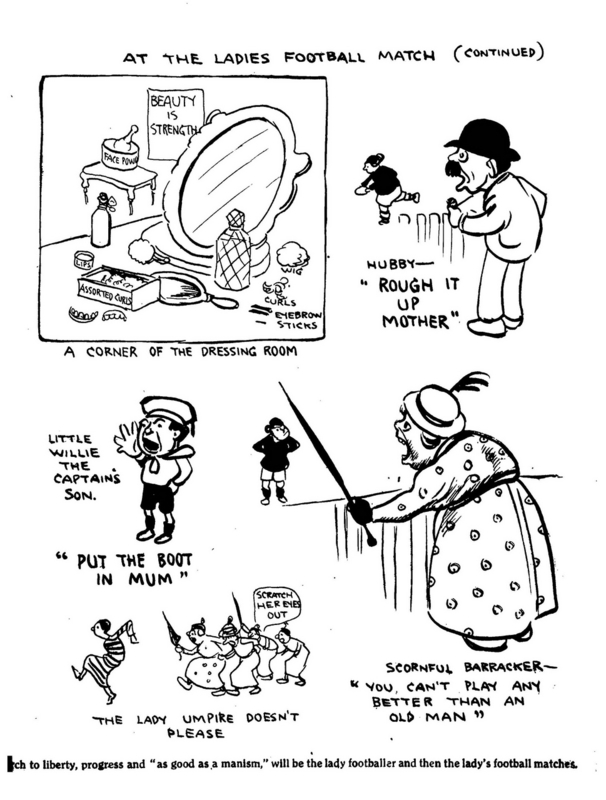 Hal Gye (1887–1967) was a cartoonist, commentator and writer. 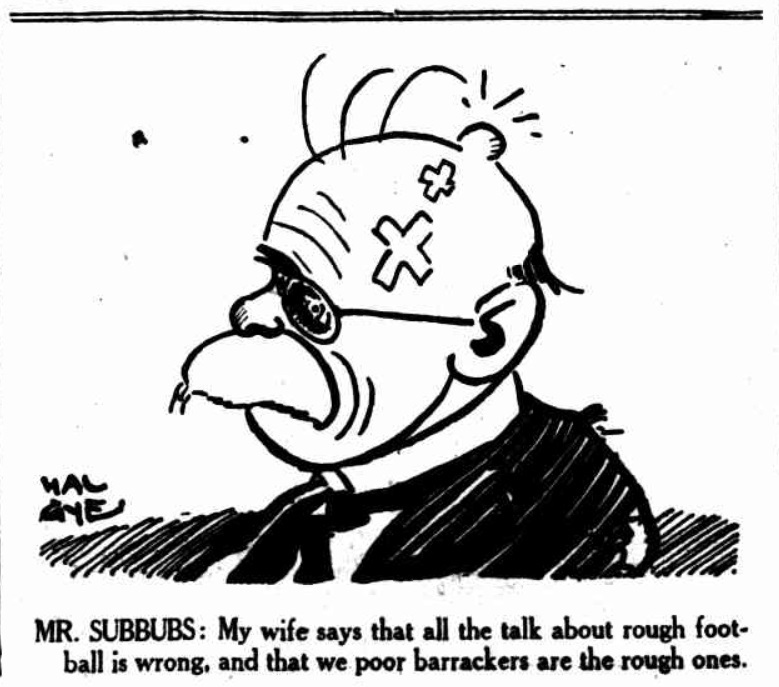 As a cartoonist he made comment on a number of issues of the day, including on football. 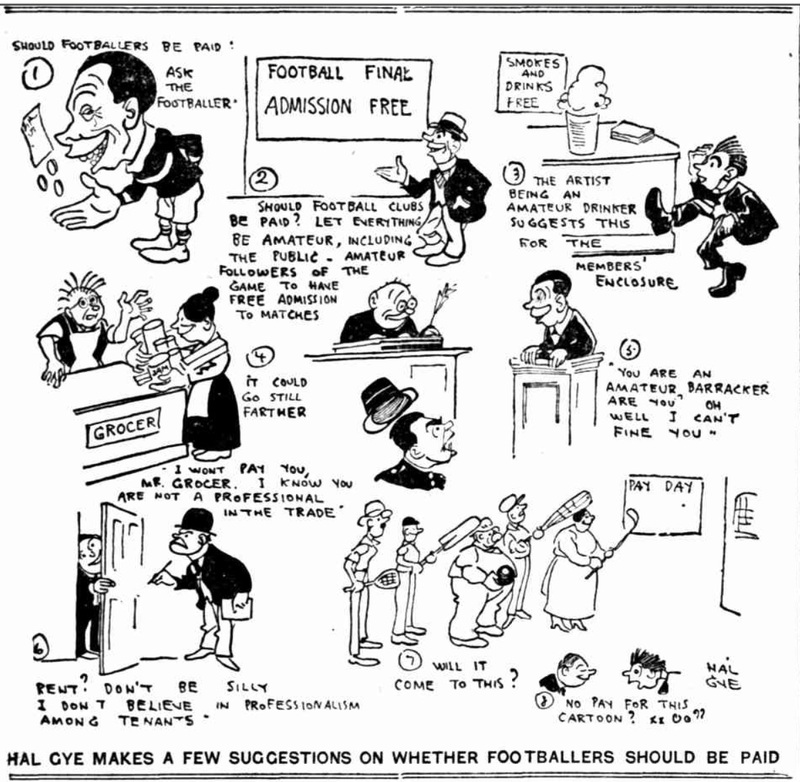 Using Gye's cartoons, already accessible on the web, this article provides a brief profile of Gye as a football cartoonist and illustrates some of the themes he tacked, including player payment and crowd violence. 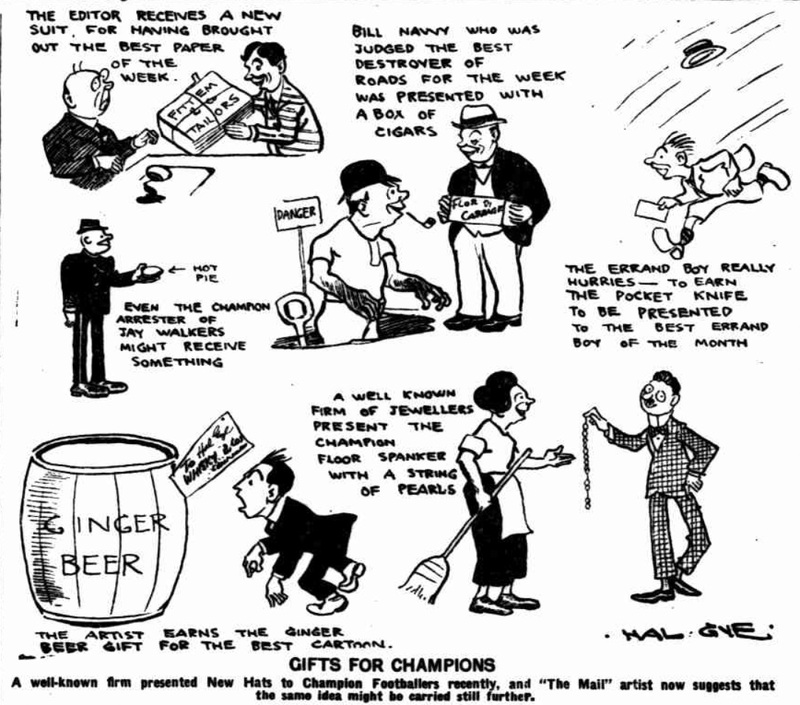 Part of his role as cartoonist was to provide illustrations reflecting key local personalities and events. 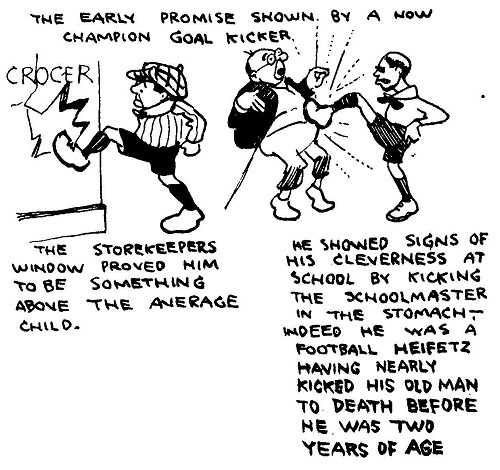 As an example, in 1913, Billy Schmidt kicked a goal after the bell to win the game. This was the first time that this had happened in a VFL match until then. Gye's terrific illustration of the event appears in a number of books and is a fine example of his work. Society was changing in the early 20th century as women lobbied for a change in society. This first wave of feminism saw women gain political representation, but also begin to challenge other social barriers. These cartoons provide an interesting insight into that change. 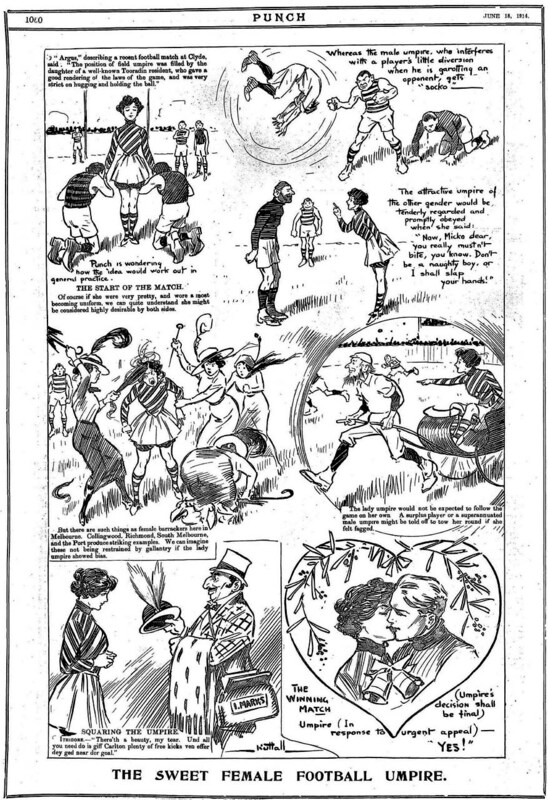 1917 would see the first matches in Australia between women's teams and womens leagues would play in the 1920's. 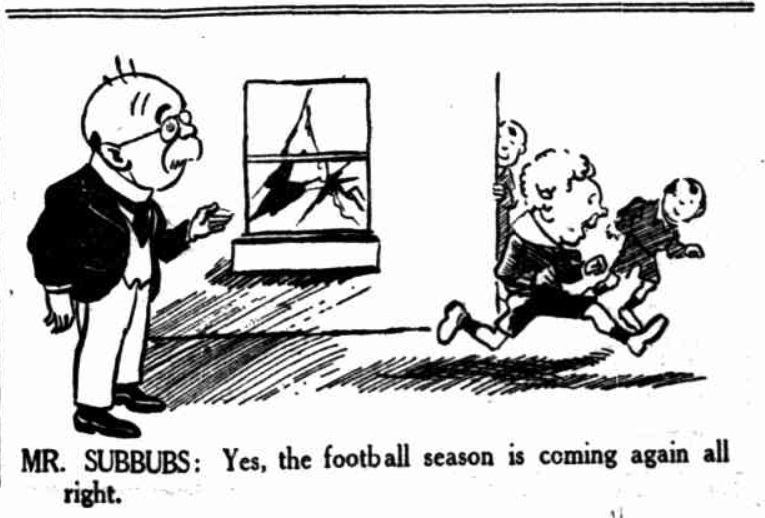 Charles Nuttall in Punch in 1914 looked at similar themes. 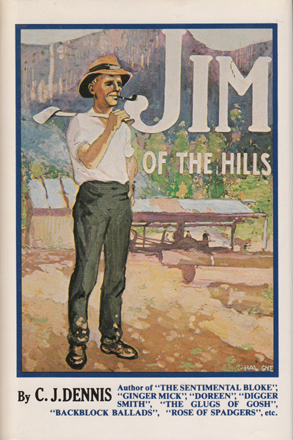 In the 1920s Gye sold and exhibited paintings. 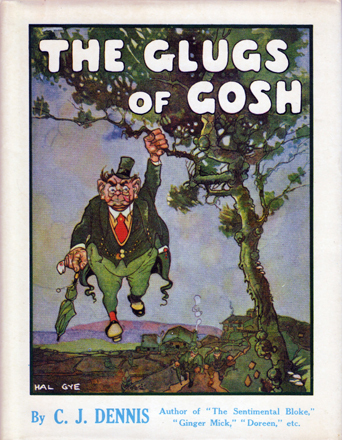 Mounted oils of 'The Glugs of Gosh' are part of the collection of the State Library of South Australia.3 In 1923 Gye picked up the job as chief artist on the 'News' newspaper. 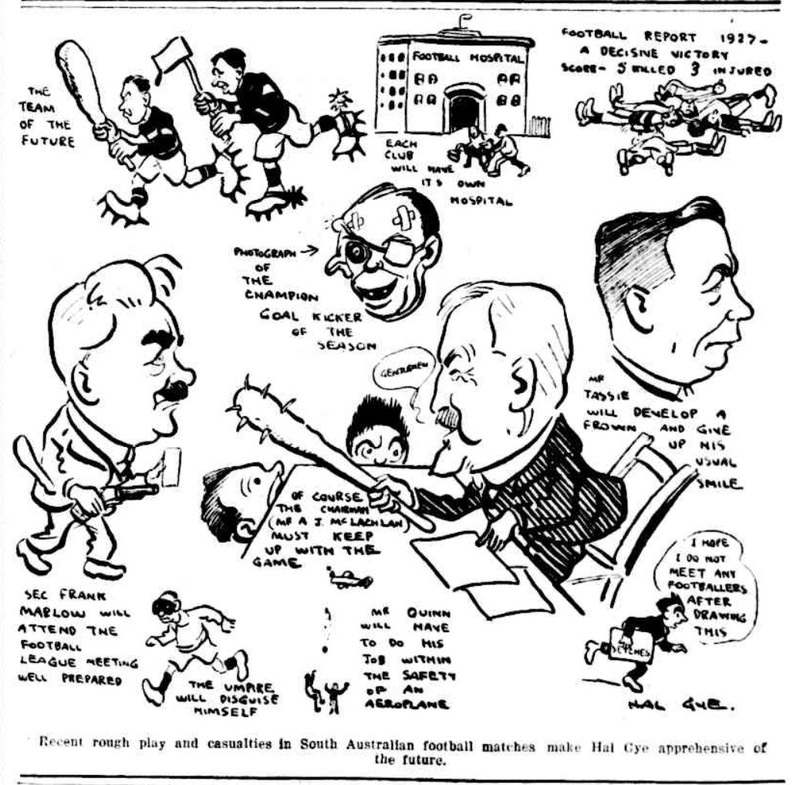 The original article can be read on Trove or in a more readable format at www.middlemiss.org where Perry Middlemis has provided a clearer copy. As a biography, CJ Dennis's piece provides a clear joyful insight into Hal Gye. 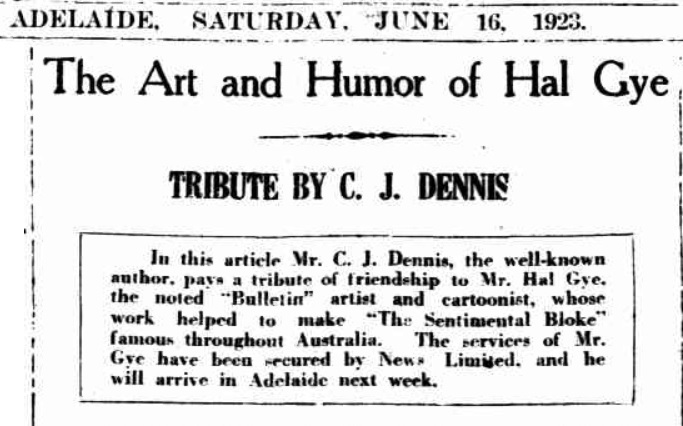 In Adelaide Gye provided regular cartoons for the 'News' and the "Mail' newspapers which are today available on the National Library of Australia's Trove website. 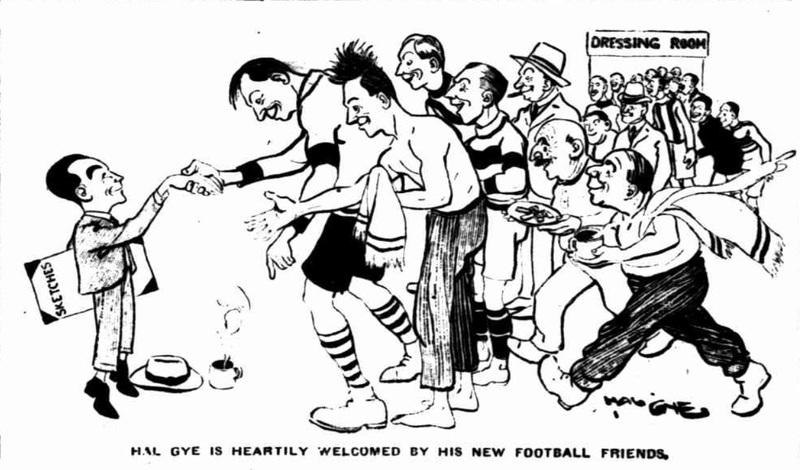 Gye provided cartoons on a range of issues but one of his earliest demonstrates how important his footballing cartoons were going to be with the panel showing Gye being welcomed by the Adelaide football fraternity. 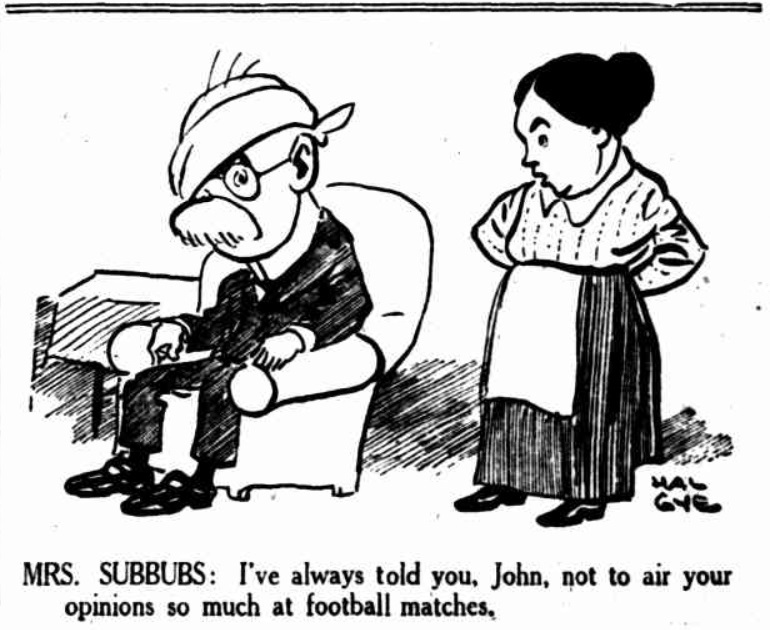 Hal Gye's fictional father John Subbubs experienced life on Gye's behalf. 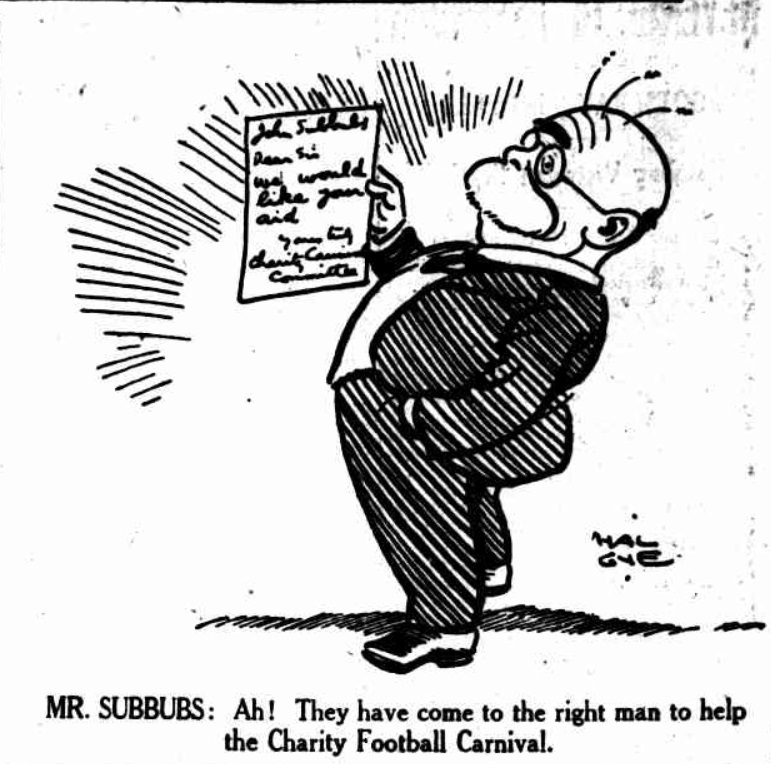 For example in Gye's own charity work the promotion and done through Subbubs. 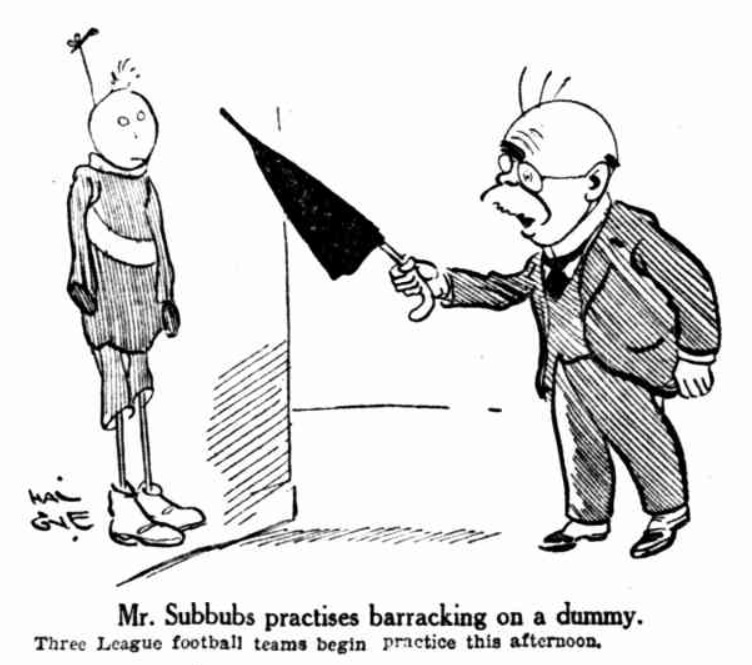 Subbubs character appeared from at least 1923-1926 in Gye's work. 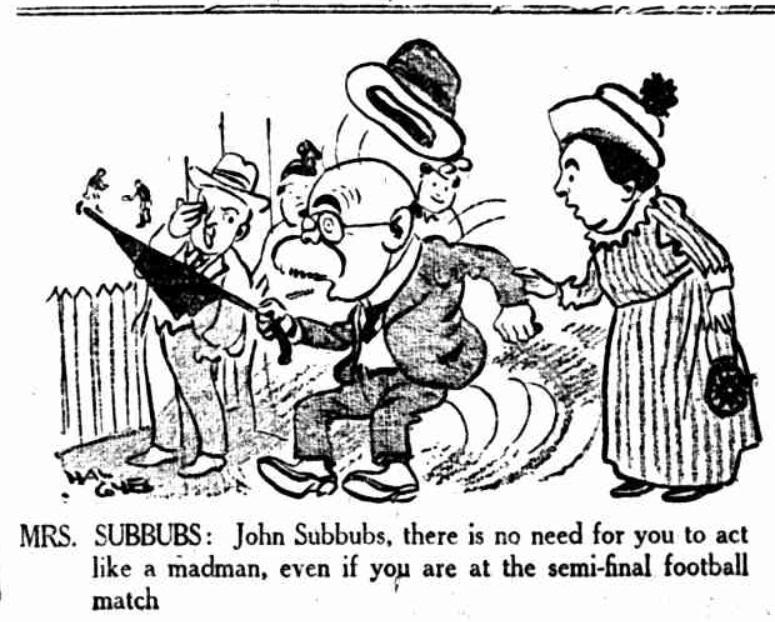 Subbubs was energetic and a keen football supporter. 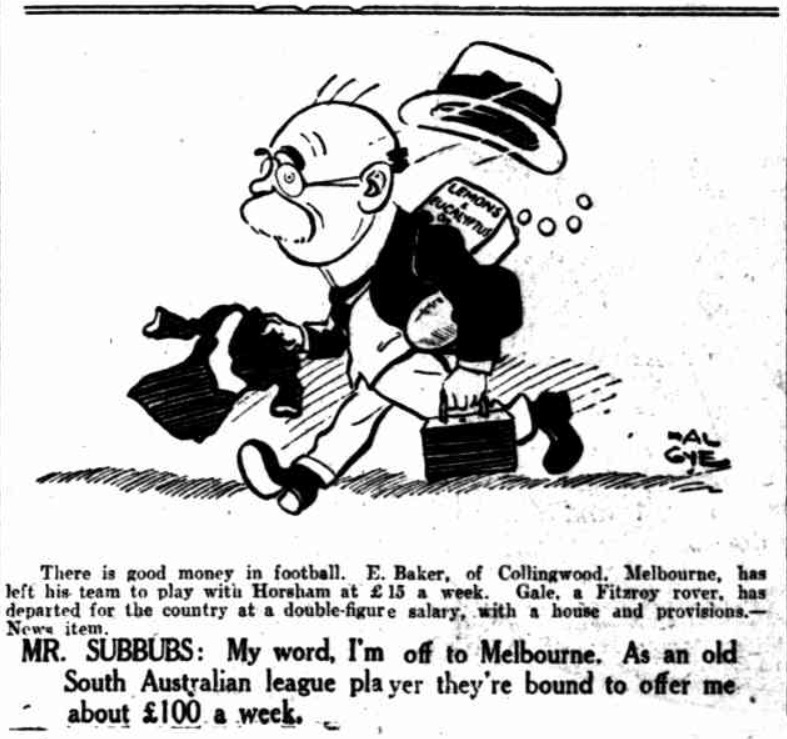 In 1925 Jimmy Bancks at the Melbourne newspaper, "the Sun Pictorial", introduced "Mr Melbourne" a character much like Mr Subbubs, and providing a similar vehicle for cartoonists to make comment. 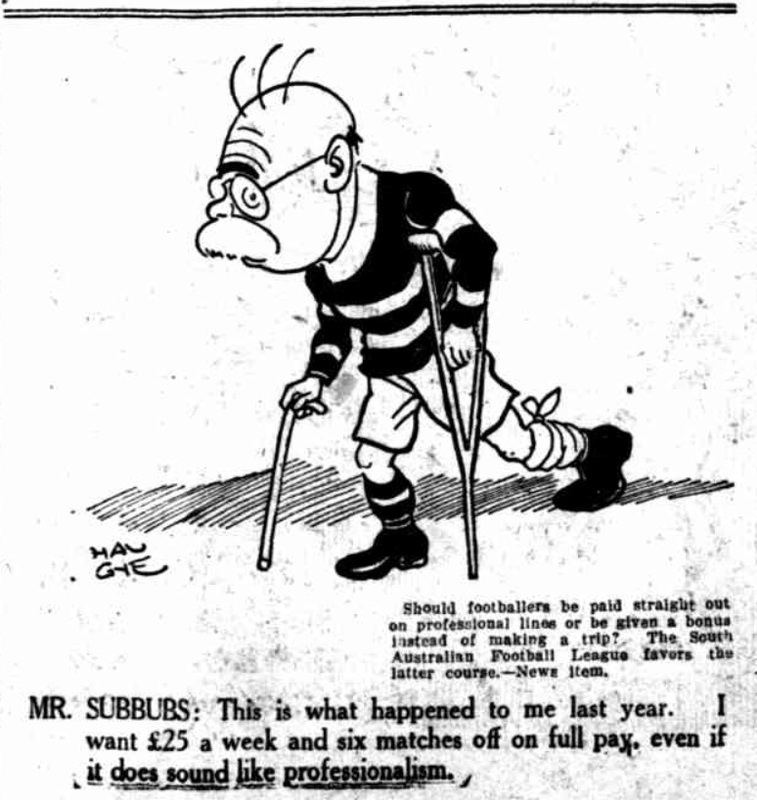 Mr Melbourne run for a number of years and was eventually illustrated by a number of cartoonists including Len Reynolds. 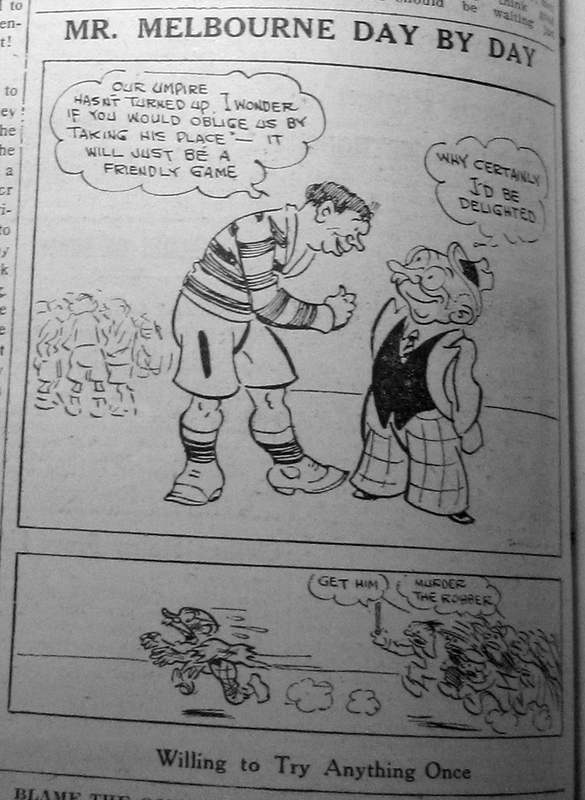 Bancks had earlier played with a strip called 'the Blimps', but is probably more famous for 'Ginger Meggs" another character he was first developing in the early 1920's. 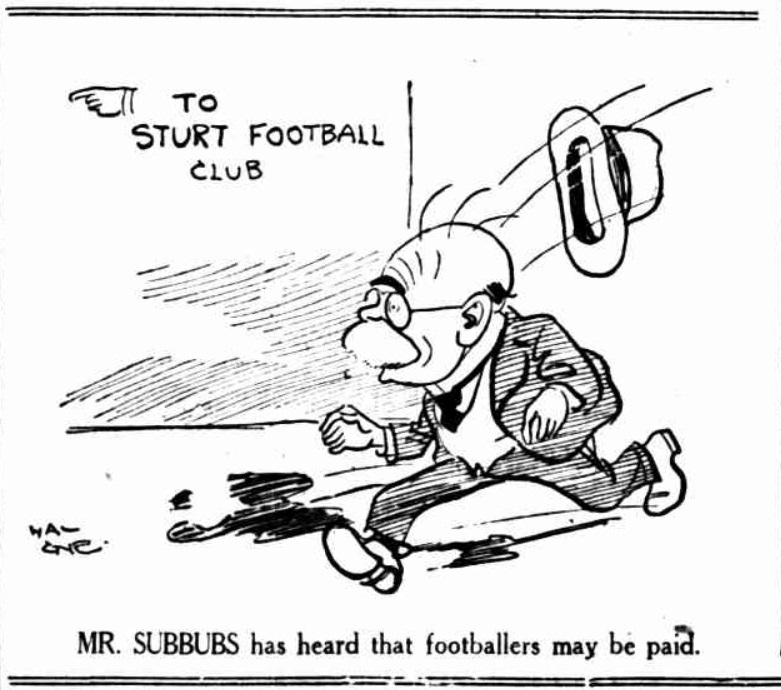 Already decided in Melbourne prior to WW1, the issue of whether players should be paid or act as amateurs was an issue at the time that Gye was in Adelaide. 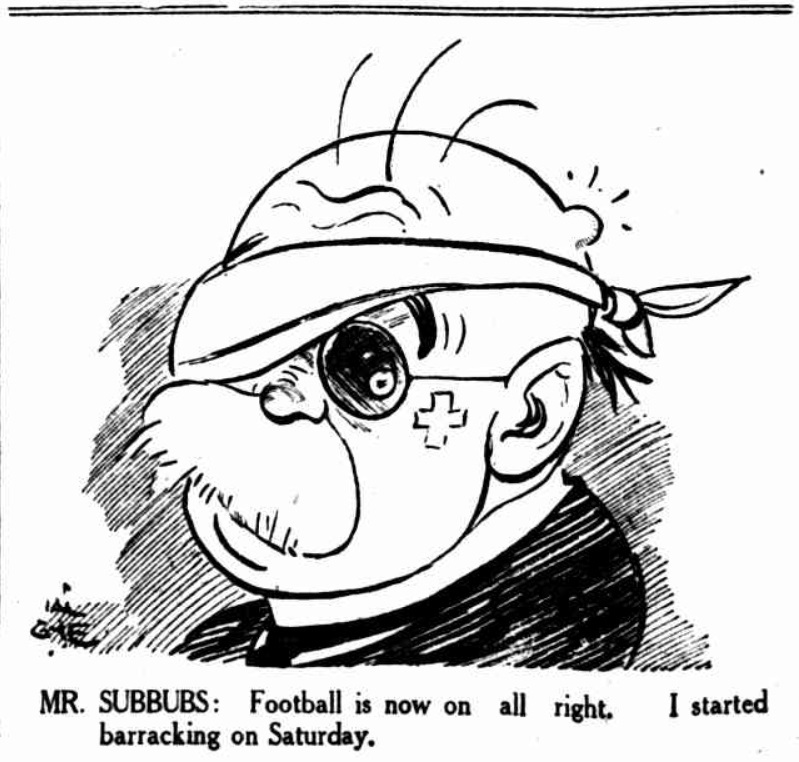 A number of his football cartoons pursue this theme. 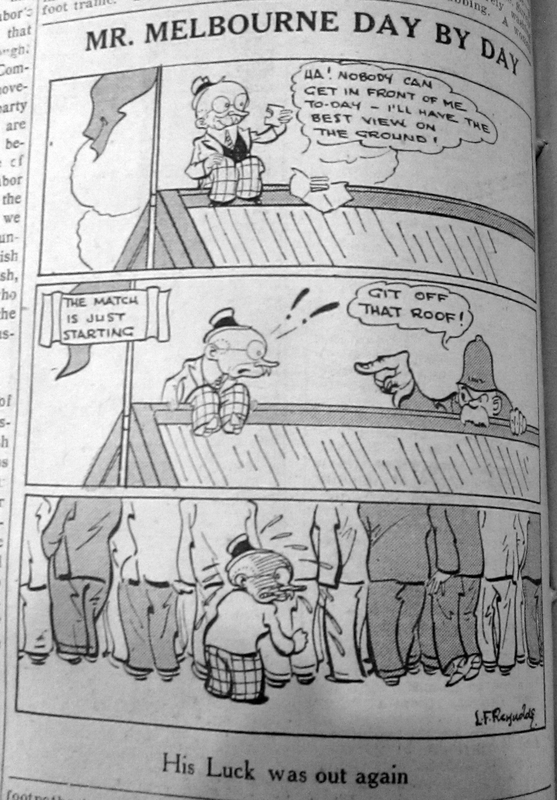 The theme of crowd violence is an interesting theme that Gye returns to a number of times in his cartoons. Violence on the field and in the crowd are drawn as if they are accepted elements of football life that readers can easily empathise with. A debate over the level of violence in Australian Rules crowds has been raised by Ian Syson on his blog neososmos. 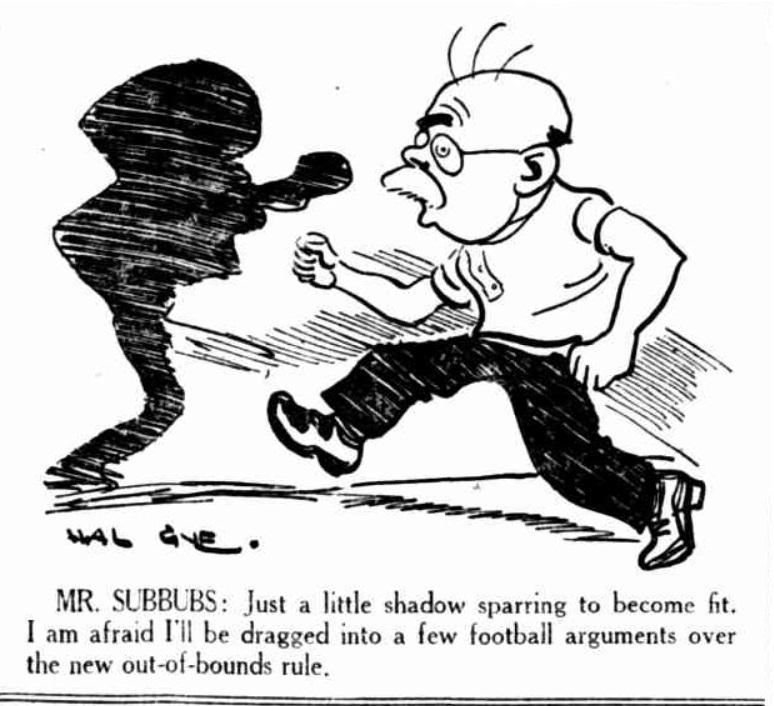 A modern reader pursuing the sport section of newspapers from the first part of the 20th century would be surprised at the level of on fights and assaults. Hal Gye's cartoons are interesting as they do not depict the violence in a negative light. 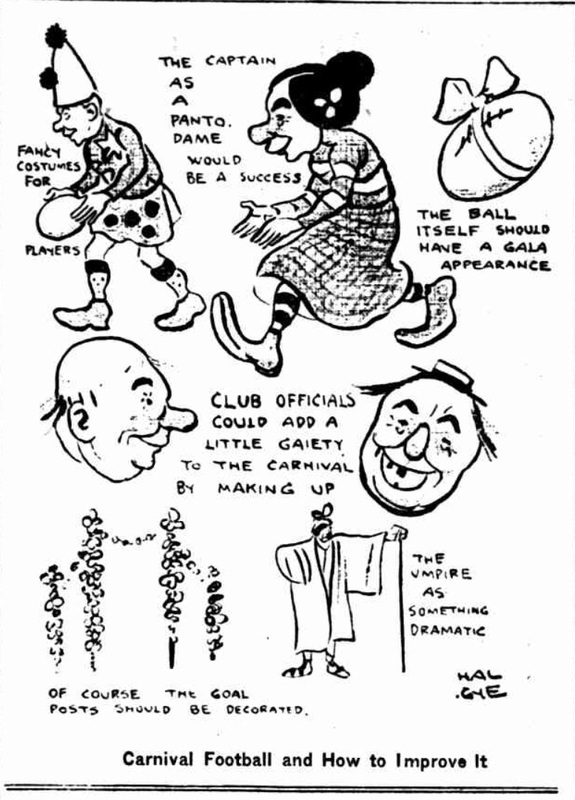 I have included a range of other images below to provide an illustration of the range of topics and styles that Hal Gye brought to his football cartooning. 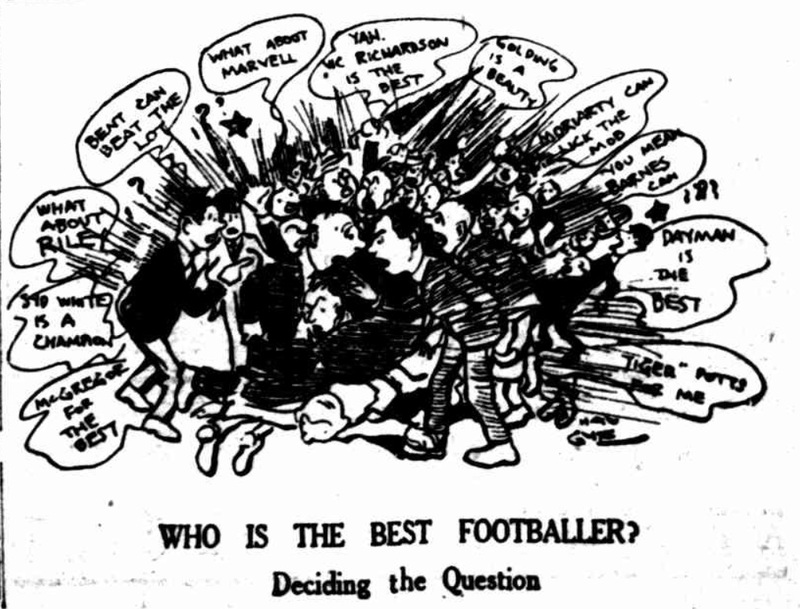 Gye's football cartons were an important and popular part of his work, though today his artistic works have become more famous as they have been collected by galleries or because of their association with CJ Dennis. 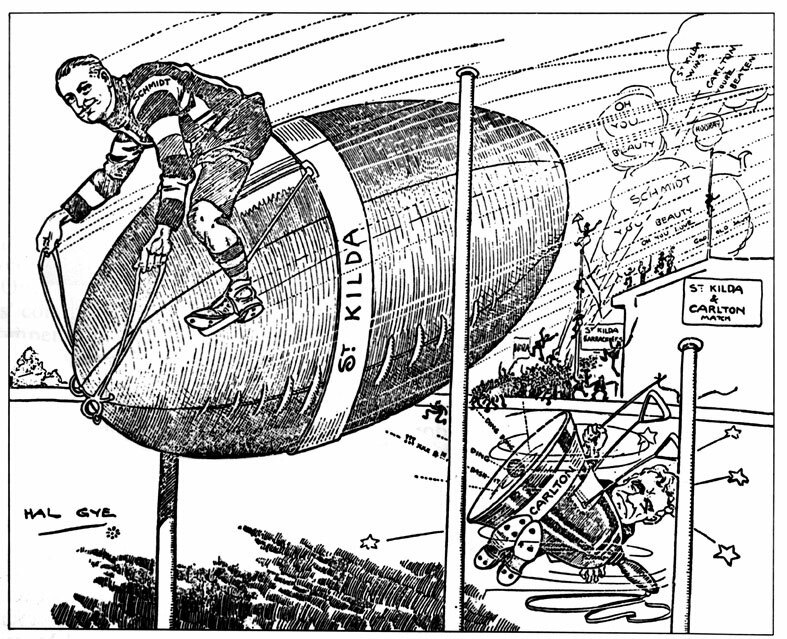 Hal Gye's cartoons deserve a wide recognition and many of the topics he illustrated are still relevant today. 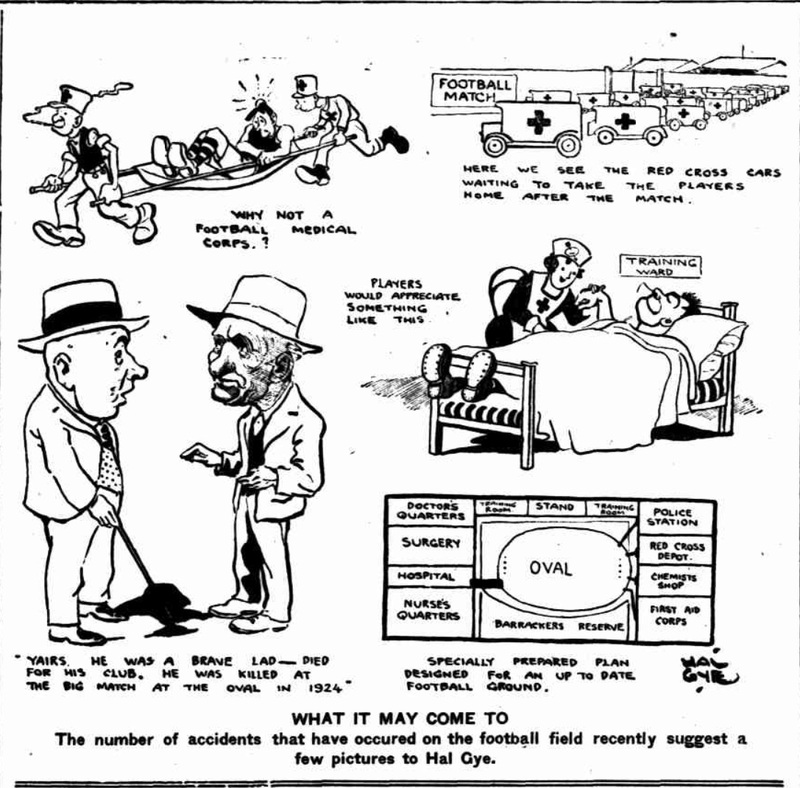 Hal Gye's work appears in a number of newspapers available via Trove the National Library of Australia. Collections of Gye's work can also be found. 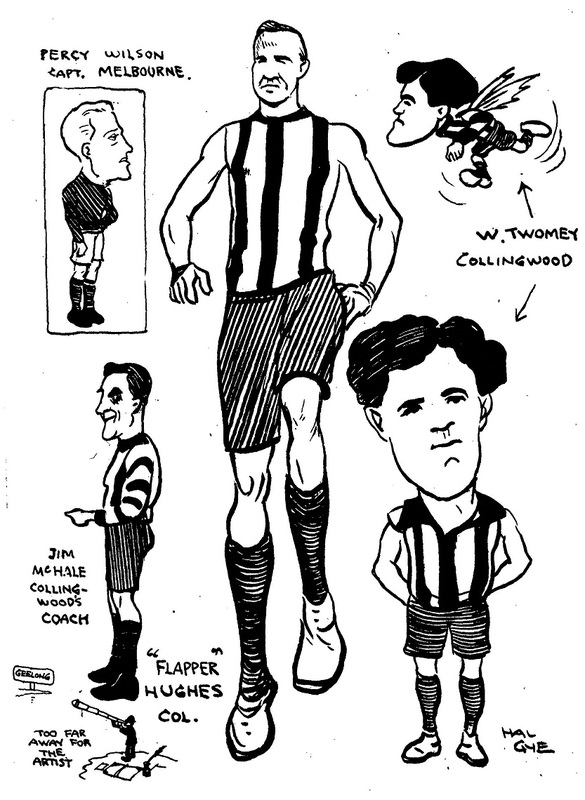 A football related collection is digitally available at the State Library of Victoria. 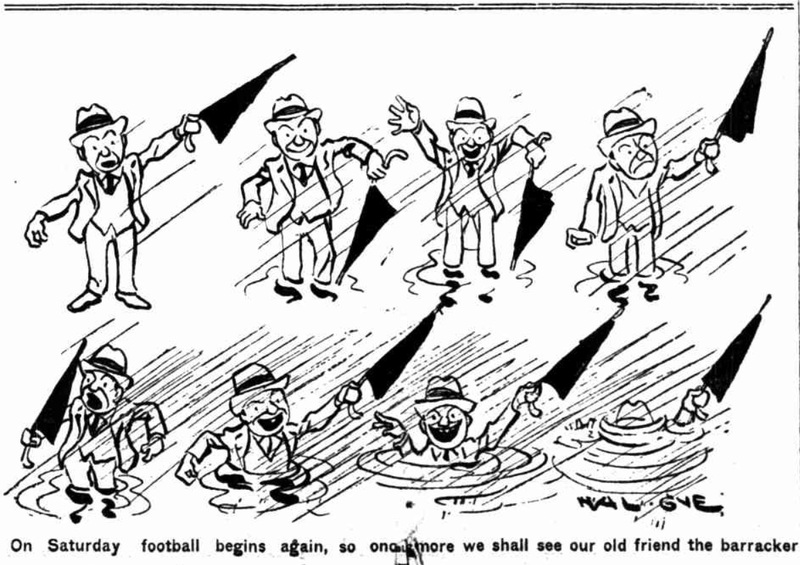 Football fragments : cartoons and caricatures / by Hal Gye. Description: 32 p. : chiefly ill. ; 28 cm. 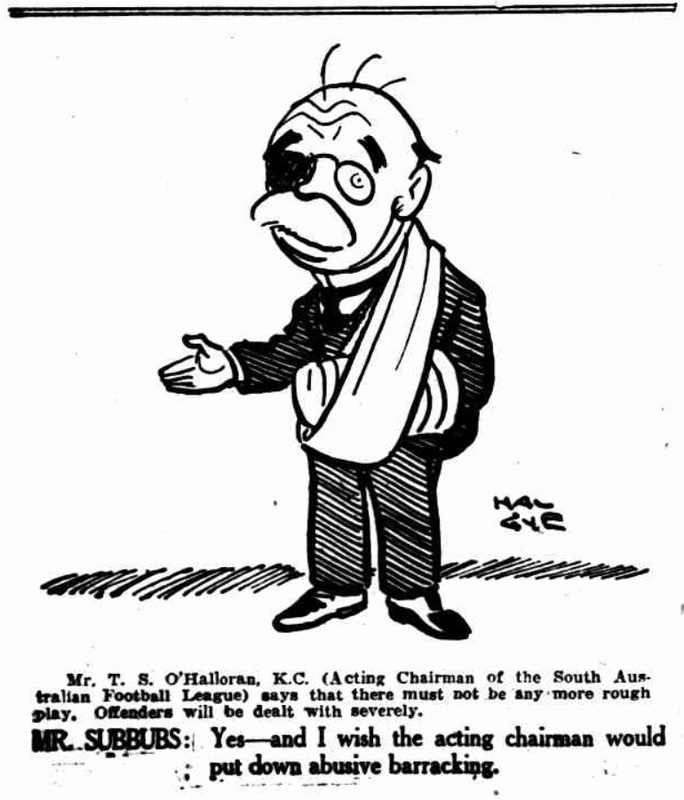 All cartoons by Hal Gye are in copyright until 2042. 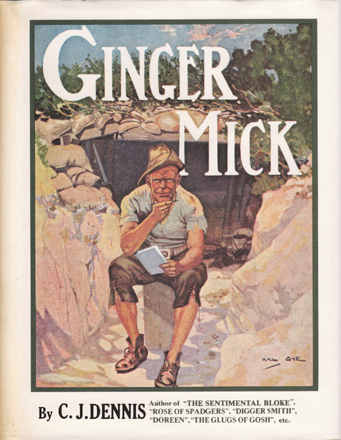 At the time of Gye’s death in 1967 copyright existed for the life of the artist plus 50 years. Gye’s work would therefore have expired in 2017. Australian copyright law was amended in 2005 and copyright was extended to life of the artist plus 75 years. I have been unable to identify the current copyright owner of Gye’s work and I would be more than happy to request permission if the current owner can be established. I have endeavoured to clearly attribute all works to Mr Gye. 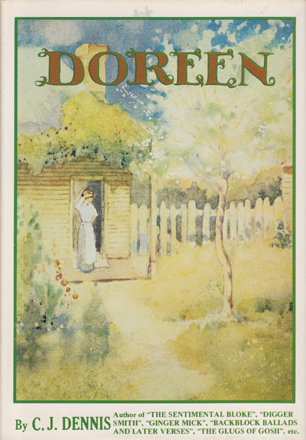 I have only included works that are already easily accessible on the internet via trove or via the State Library of Victoria. These is no attempt to make money from the use of Mr Gye’s work, and the article on his work is intended in an academic spirit. Note - This article has been limited to a review of available sources. 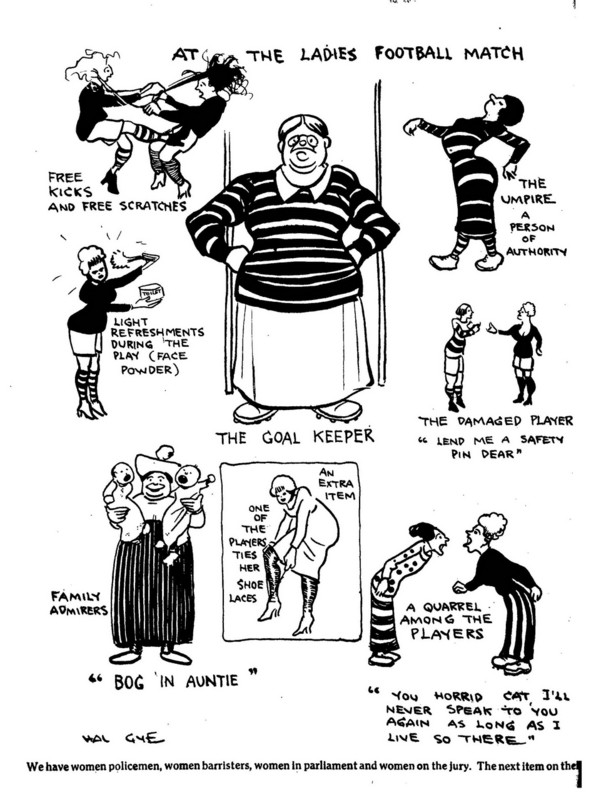 Many of Gye's early Victorian football cartoons are as yet not available online and a review of those illustrations may add other themes and perspectives to his work.